The Australian Gold Kangaroo is technically known as the Australian Gold Nugget, though very few people refer to it by this name. The coin was first introduced to the public around the same time as the Gold American Eagle, in 1986. Though it is manufactured by the Gold Corporation, it is still considered a product of Australia’s mint because this company is entirely owned by Western Australia’s government. The initial design, which was maintained until 1989, featured gold nuggets, something that has since been changed to Kangaroos as they are seen today. The original currency face values on the coins had to be altered in 1992 so that they were in line according to their sizes. One of the most unique characteristics of the Kangaroo that sets it apart from other national coins is the fact that its design changes on an annual basis. In addition to this, the actual quantities that are minted vary from year to year. All of these factors together allow for the Kangaroo to stand as one of the most collectible, desirable, and valuable coins in the numismatic world. 1/10th oz. gold coins are the second smallest version of the Australian Gold Kangaroo, as the actual lightest weight of these coins sits at 1/20th of an oz. For many collectors and investors, however, 1/10th is as small as they are looking to buy. In the future this may change, though. Each 1/10th ounce coin has a diameter of 16.10 mm and a thickness of 1.30 mm. Unlike other coins where actual weight may very from the face weight, Kangaroos weigh the exact amount they say they do, which in this case is 0.1000 troy oz, or 3.11 grams. In terms of actual currency face value, the 1.10th oz. coins are worth $15 each. The 1/4 oz. Kangaroo coin is one step up from the smaller 1/10th oz. version. These gold coins carry a diameter of 20.10, a thickness of 1.80 mm and a weight of 0.2500, or 7.78 grams. The face value of the 1/4 ounce coin is $25. 1/2 ounce Gold Kangaroos are just one level away from the largest most commonly traded coin. For many buyers and investors, 1/4 and 1/2 coins are the best option available. These particular coins have a diameter of 25.10 mm, a thickness of 2.20 mm, an weight just a tad over their listed weight at 0.5001 troy ounces, which is the equivalent of 15.55 grams. For the face value, the 1/2 oz. coin is set at $50. 1 oz. is the standard and most prolific version of the Australian Gold Kangaroo. Though it will cost you a pretty penny, this size coin is always going to make a brilliant addition to any collection of investment. If you want the gem of the Kangaroo lineup, this is most certainly it. The diameter of the 1 ounce coin is 32.10 mm, the thickness is 2.65 mm, and the weight is fractionally higher than 1 oz., at 1.001 troy ounces, which translates to 31.10 grams. These coins have a face value of $100. As was mentioned previously, the Australian Kangaroos are among the most collected coins in the world. As such, you should expect to pay a premium on any purchase that you make. With that said, there are few coins out there that make for better buys than the Kangaroo. Their unique design, appeal and inherent rarity makes them both aesthetically pleasing and financially sound investments. Buying Kangaroos is a simple process when you are shopping around online with gold dealers and companies. 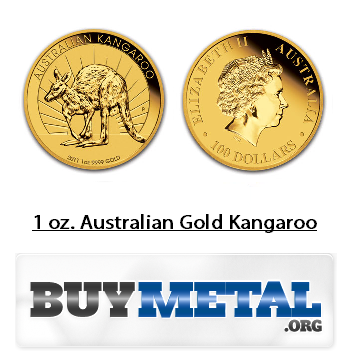 All of the top of the line dealers will have all of the aforementioned weights of the Gold Kangaroo available in their inventory. If you are a collector of gold bullion and coins, you already know how these coins appreciate in value. 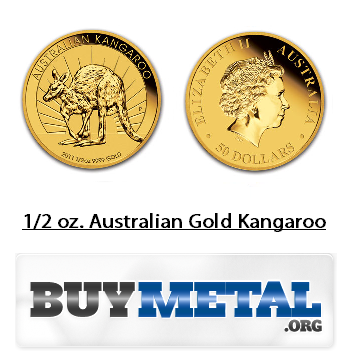 If your goal is to invest in gold, Kangaroos are a great way to do it. They hold long standing value in markets around the world and will forever remain a staple in Australian currency. Buy a few of these beautiful coins and your portfolio will reap the rewards later.